We had our first snowfall of the year on Sunday. I had been waiting for snow for quite some time. I love snow days. I love how cozy they are. I love how the world gets silent when the snow falls. I love sipping hot chocolate and making snow angels. However, I must say there is one thing I do not like about snow days. I do not like when snow days happen to fall on the day that I scheduled a massage. So instead of relaxing and spending the day in the spa, I spent the afternoon in the kitchen making these comforting meatballs. After eating them I almost forgot about the massage. Almost. Anything with roasted garlic is bound to be a favorite in our home. And these meatballs are no exception. The garlic is sweet and fragrant. The herbs add a lovely earthy flavor. And the turkey that the recipe calls for makes a meatball that is much lighter than the traditional beef meatball. 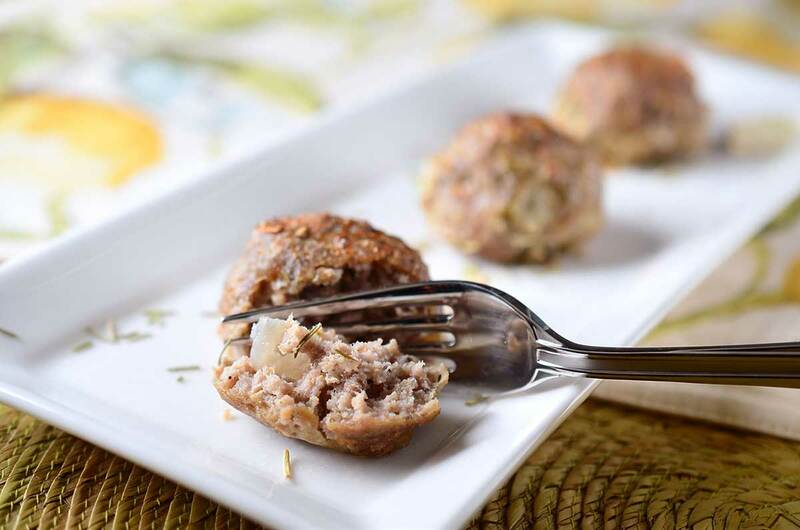 While I served these meatballs for dinner with mashed potatoes, gravy and green beans, I think that with some toothpicks stuck in them these would make the perfect addition to any cocktail party or say… the perfect snack after a rescheduled massage. Combine turkey, shallots, egg, rosemary, sage, thyme, kosher salt and pepper in a bowl. Use a fork to remove garlic cloves from the skin and add to the mixture. Mix well. Roll into approximately 15 meatballs. Place meatballs in a baking dish. Drizzle olive oil over the top. Bake in 350 degree oven for 30 minutes. Turn on the broiler for 5 minutes to brown. Serve. The meatballs sounds fantastic. I love how sweet garlic gets when you roast it – I bet these were hard to stop eating! I hate wasting any of the garlic. When I roast it, I cut it in half across the middle and roast the whole thing, then squeeze it out. Nonetheless this sounds really good.